Naminé watches over Sora's Pod as she repairs his fake memories. Memory is a key element of the Heart in the Kingdom Hearts universe, and form a strong part of the heart's existence. They are similar to the real-world definition of memories, but possess greater reality, leading to severe ramifications if they are lost or forgotten, going so far as to collapse a person's heart or even rewrite reality. An example would be the Riku Replica. Memories are also contained within the heart. While they can be concealed or forgotten, memories can never truly fade. The heart will recognize things the mind may not, a sort of "déjà vu" feeling. For example, Leon does not consciously remember Sora and his friends in Kingdom Hearts Chain of Memories. However, he does know Sora's name and feels as if they were friends. The Remembrance synthesis material in Kingdom Hearts II Final Mix supports and embraces memories. After Ventus is defeated by the Neoshadows sent out by Master Xehanort, and stripped of the darkness in his heart, he was left without his memory. When Terra and Aqua later attempted to ask him questions, his confusion due to the lack of memories caused him to panic and fall unconscious. Later, on Destiny Islands, Ventus encounters Vanitas, and begins to remember several of his lost memories. Much later, after Master Xehanort takes over Terra's body, Terra fights back several times, prompting the new Xehanort to turn the Keyblade on himself to rid himself of Terra's heart, but Terra's heart still remains inside Xehanort's body and this leads to Xehanort's amnesia, rendering him unable to wield the Keyblade anymore. Throughout his adventure, Sora experiences flashbacks to him and Riku as kids on Destiny Islands. One piece of memory was when they first went into the secret place and they first saw the door. This is also when they talk about Kairi first coming to the island. Kairi's heart, and therefore her memories, are inside Sora's body for much of the quest. This causes him to periodically see visions of her. Also, Sora's mind once connected to Kairi's memories inside her heart. This allowed him to see a forgotten memory of Kairi and her grandmother in the library of Hollow Bastion, just talking. Memory is also one of the ingredients Dr. Finkelstein asks Sora, Donald, and Goofy to retrieve. It appears in the form of a Forget-Me-Not, and is given by Sally. Dr. Finkelstein uses it in an attempt to make a synthetic heart so Jack Skellington can make the Heartless dance, but the experiment fails. While Sora and company climbed the floors of Castle Oblivion, Naminé, under Marluxia's orders, was slowly stripping the hero of all his memories, only to replace them with new, false ones. Also, Vexen makes a replica of Riku and orders Naminé to put false memories of him, Sora, and herself at Destiny Islands, with the Replica replacing the real Riku and Naminé replacing Kairi. Later, when the Riku Replica fights and is about to finish off Sora, Naminé erases all of the replica's false memories, causing him to faint. When he wakes, he remembers that he is just a replica. After defeating Marluxia and rescuing Naminé, Sora is left to sleep in a memory pod while Naminé restores his chain of memories. Although most of the members of Organization XIII have memories of their pasts, Roxas and Xion do not. Also, Sora's memories were the source of both Roxas and Xion's power. Unlike most people, Sora was a Heartless for a very short time, which is why Roxas does not have memories of Sora. In Xion's case, it is simply because she did not have a past to begin with. Also, Xion is an imperfect replica of Roxas, made from Sora's lost memories. Because all of Sora's memories inside her are of Kairi, Xion takes Kairi's general appearance, with some changes. Additionally, because Xion is entirely made up of memories, when Roxas defeats her and she disappears, nobody remembers her. When Roxas is captured, DiZ orders Naminé to erase his memories and put in false ones of him, Hayner, Pence, and Olette. He is then put in a virtual copy of Twilight Town to hide from the Organization and absorb the last of Sora's lost memories. In the virtual Twilight Town, Roxas begins to see some of the memories of Sora in his dreams. He also begins to remember the memories of his former self when he makes his way through the mansion. After Roxas merges with Sora, his memories remain within Sora, as shown when Sora feels familiarity with Roxas's Twilight Town and friends. To investigate the new message in Jiminy's Journal from the first Kingdom Hearts, its content was transferred into a data world. 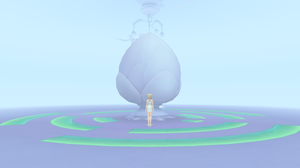 Although the pages were erased by Naminé in Kingdom Hearts Chain of Memories, the memories of the journal itself remained intact. It seems his memories connect with everyone. His memories are the power source of Roxas and Xion. He is known as the "Key That Connects Everything". The Nobody Naminé has the unique talent to alter the "links" in a person's memories, though this is limited to Sora and those who have any connection to him. She can create new memories, alter existing memories, or erase memories completely. When Sora has most of his memories "un-linked", Naminé had him sleep so they can be reconnected properly. The false memories Naminé has created will be forgotten in the process. However, Sora claims that "even if the links are broken, they're still there", and though his memories of Castle Oblivion and Naminé will be forgotten, they will never be lost. It is possible that Sora's memories of the Castle Oblivion incident are indeed still within his heart, but are deep down and will not be easy to recall. Memories are particularly important to Nobodies and Organization XIII. As Nobodies do not have hearts, they do not truly exist. Memories are all that allow them to maintain their fragile existences. The Nobodies of Organization XIII also use memories of when they had hearts to fake emotion and give the appearance that they have hearts. The fortress Castle Oblivion was used by the Organization to conduct experiments on memories. In the castle, entire worlds can be created, using cards formed from memories. The memories of Xehanort are a key plot element in the game Kingdom Hearts Birth by Sleep. According to Ansem the Wise, when he found Xehanort, he had no memories but for his name. The phrase "Memory of Xehanort" appears in "The Gathering", the secret ending of Kingdom Hearts II, that is related to Birth by Sleep. It is also known that Xehanort's Nobody Xemnas was searching for the "Chamber of Waking" in Castle Oblivion, which was connected to the "Chamber of Repose" in Radiant Garden/Hollow Bastion. As Sora had to sleep for Naminé to re-link his memories, there seems to be a connection between sleep and memories. Although, what that connection is unknown. Memories may also have some sort of connection to the Keyblade. Roxas dual-wields the Oathkeeper and Oblivion Keyblades, which represent Sora's memories of Kairi and Riku, respectively. Furthermore, once Roxas recovers his memories of his time as an Organization member, he is able to manifest these two Keyblades at will. Before he regained his memories, he could only conjure the Kingdom Key. It has been speculated that the keychains Sora uses to augment his Keyblade are formed from his memories. As keychains usually represent a world or a specific person, it could be possible that the keychains are formed from Sora's memories of that world/person. This would also explain why Riku is unable to use Sora's keychains for his Keyblade, as they are not formed from his memories. On the other hand, this could also explain why Roxas and Xion can share keychains in Kingdom Hearts 358/2 Days, due to Xion's peculiar nature of existence, which revolves around memory itself, as well as why Sora does not retain the keychains they earn exclusively in Kingdom Hearts 358/2 Days, such as Rejection of Fate, as their memories are still separate from his. In Kingdom Hearts 358/2 Days, Xion's existence is comprised of Sora's memories, taking on Kairi's appearance due to Sora's strong feelings for her, and the fact that she began to claim Sora's memories as her own as well. In some of the Secret Reports Xion writes, she dreams of drowning in the ocean or hearing the sound of waves in the distance. This could suggest that the leaked memories inside of her entity are awakening in the form of dreams, or a reference to Sora and his dreams in Kingdom Hearts. Throughout the game, she begins to remember things about Sora and Kairi, like the Keyhole in Agrabah, or stating that she has met Axel in Castle Oblivion before. Xion comes into contact with Naminé, and it is here that she learns of her origins. Naminé proceeds to tell her that as a memory being, returning to Sora will cause everyone's memories of her to be erased, a process that cannot be prevented. Xion accepts the facts, but before she is able to return to Sora, DiZ informs the two that Axel has followed her. Xion attempts to fend him off, but fails and is taken back to the Castle That Never Was. Xemnas appears and reprograms Xion with the machine like forms she transforms into when battling Roxas. As she fades in Roxas' arms, she states that she is going back to Sora, fulfilling her goal. However, this causes Sora's memory restoration to come to a complete stop, leading to Riku's infamous battle with Roxas at Memory's Skyscraper. In Kingdom Hearts coded, it talks about the memory of the Jiminy's Journal and the Journal Incarnate. When Jiminy tells the King about the mysterious message, the King digitalizes the journal and then the Bug Blox Corruption appears. So Mickey created Data-Sora to destroy the Blox and the Journal appear right after Sora appears in the data world. After Sora heals different data worlds, there is a computer monitoring the data world. The video shows the King and the others the memory of the journal, like there are some of the memories that Jiminy never wrote about. In episode The Journal reveals himself to Sora, King Mickey, and others about his identity. The incarnate doesn't know why the messages appear, why the blocks happened, and why is he in Riku's form and vessel of the journal. It also seems he doesn't know what happened to the journal or the data world. So he asks for Sora, the King, and others for help. It is revealed the reason Disney Castle's Computer kept showing things Jiminy never wrote about is because it shows the Journal's sleeping memories. This page was last edited on 29 March 2019, at 20:57.